Finally, my outstanding date with Boracay came. I was supposed to spend it with a friend but she has to call it off due to health restrictions, so, naturally, I have to ask the Cheese. I'm super thankful because it was not easy for him to get out of the office, look for someone willing to swap with his current schedule at a time when overtime and absolutely-no-absence policy was being imposed. I thank Bathala! 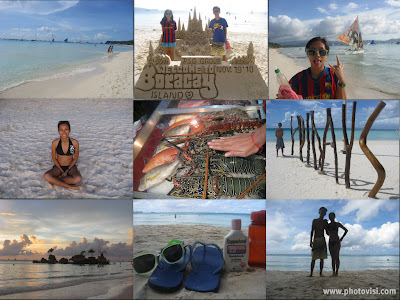 I'm a Boracay virgin so my perception of the island and what it's supposed to be were solely based on what my friends and other people's stories, what I read on blogs and what I've seen on the telly. Well, I've seen better beaches. I admit though that the proximity of lodges/hotels/restaurants/bars/stores and whathaveyou's amazed me. Everything is within a 10-meter radius. If you ran out of water or need some meds for an upset tummy, you can always run to the nearest [drug]store. No one can argue that food or bar choices are limited because there are tons of stores to choose from, or spots, stalls, everything! I'd like to commend the local government for one thing. A spotlessly clean port, beach and shoreline. I was having a mini fit with all the fees we were paying for upon arrival (environmental, terminal and another I forgot!) but seeing as they take good care of the place (as only fitted), maintaining its world class quality, I'd have to say that at least the money's going somewhere (which is a rarity in Philippine system so please don't judge me haha). For that observations alone, you have my respect Boracay. I, we had so much fun. Until next time! PS: I got too lazy to do photo collage on paint manually (photoshop be darned!) so I resorted to an online photo collage maker. Keber na.